Chinese Furniture: Probable source of artistic taste—Sir William Chambers quoted— Racinets "Le Costume Historique"—Dutch influence—The South Kensington and the Duke of Edinburgh Collections—Processes of making Lacquer—Screens in the Kensington Museum. Japanese Furniture: Early History—Sir Rutherford Alcock and Lord Elgin—The Collection of the Shogun—Famous Collections—Action of the present Government of Japan—Special characteristics. Indian Furniture: Early European influence—Furniture of the Moguls—Racinets Work—Bombay Furniture—Ivory Chairs and Table—Specimens in the India Museum. Persian Woodwork: Collection of Objets dArt formed by General Murdoch Smith, R.E.—Industrial Arts of the Persians—Arab influence—South Kensington Specimens. Saracenic Woodwork: Oriental customs—Specimens in the South Kensington Museum of Arab Work—M. dAveune's Work. e have been unable to discover when the Chinese first began to use State or domestic furniture. Whether, like the ancient Assyrians and Egyptians, there was an early civilization which included the arts of joining, carving, and upholstering, we do not know; most probably there was; and from the plaster casts which one sees in our Indian Museum, of the ornamental stone gateways of Sanchi Tope, Bhopal in Central India, it would appear that in the early part of our Christian era, the carvings in wood of their neighbours and co-religionists, the Hindoos, represented figures of men and animals in the woodwork of sacred buildings or palaces; and the marvellous dexterity in manipulating wood, ivory and stone which we recognize in the Chinese of today, is inherited from their ancestors. Sir William Chambers travelled in China in the early part of the last century. It was he who introduced "the Chinese style" into furniture and decoration, which was adopted by Chippendale and other makers, as will be noticed in the chapter dealing with that period of English furniture. He gives us the following description of the furniture he found in "The Flowery Land." "The moveables of the saloon consist of chairs, stools, and tables; made sometimes of rosewood, ebony, or lacquered work, and sometimes of bamboo only, which is cheap, and, nevertheless, very neat. When the moveables are of wood, the seats of the stools are often of marble or porcelain, which, though hard to sit on, are far from unpleasant in a climate where the summer heats are so excessive. In the corners of the rooms are stands four or live feet high, on which they set plates of citrons, and other fragrant fruits, or branches of coral in vases of porcelain, and glass globes containing goldfish, together with a certain weed somewhat resembling fennel; on such tables as are intended for ornament only they also place little landscapes, composed of rocks, shrubs, and a kind of lily that grows among pebbles covered with water. Sometimes also, they have artificial landscapes made of ivory, crystal, amber, pearls, and various stones. I have seen some of these that cost over 300 guineas, but they are at best mere baubles, and miserable imitations of nature. Besides these landscapes they adorn their tables with several vases of porcelain, and little vases of copper, which are held in great esteem. These are generally of simple and pleasing forms. The Chinese say they were made two thousand years ago, by some of their celebrated artists, and such as are real antiques (for there are many counterfeits) they buy at an extravagant price, giving sometimes no less than £300 sterling for one of them. "The bedroom is divided from the saloon by a partition of folding doors, which, when the weather is hot, are in the night thrown open to admit the air. It is very small, and contains no other furniture than the bed, and some varnished chests in which they keep their apparel. The beds are very magnificent; the bedsteads are made much like ours in Europe—of rosewood, carved, or lacquered work: the curtains are of taffeta or gauze, sometimes flowered with gold, and commonly either blue or purple. About the top a slip of white satin, a foot in breadth, runs all round, on which are painted, in panels, different figures—flower pieces, landscapes, and conversation pieces, interspersed with moral sentences and fables written in Indian ink and vermilion." From old paintings and engravings which date from about the fourteenth or fifteenth century one gathers an idea of such furniture as existed in China and Japan in earlier times. In one of these, which is reproduced in Racinet's "Le Costume Historique," there is a Chinese princess reclining on a sofa which has a frame of black wood visible, and slightly ornamented; it is upholstered with rich embroidery, for which these artistic people seem to have been famous from a very early period. A servant stands by her side to hand her the pipe of opium with which the monotony of the day was varied—one arm rests on a small wooden table or stand which is placed on the sofa, and which holds a flower vase and a pipe stand. On another old painting two figures are seated on mats playing a game which resembles draughts, the pieces being moved about on a little table with black and white squares like a modern chessboard, with shaped feet to raise it a convenient height for the players: on the floor stand cups of tea ready to hand. Such pictures are generally ascribed to the fifteenth century, the period of the great Ming dynasty, which appears to have been the time of an improved culture and taste in China. From this time and a century later (the sixteenth) also date those beautiful cabinets of lacquered wood enriched with ivory, mother of pearl, with silver and even with gold, which have been brought to England occasionally; but genuine specimens of this, and of the seventeenth century, are very scarce and extremely valuable. The older Chinese furniture which one sees generally in Europe dates from the eighteenth century, and was made to order and imported by the Dutch; this explains the curious combination to be found of Oriental and European designs; thus, there are screens with views of Amsterdam and other cities copied from paintings sent out for the purpose, while the frames of the panels are of carved rosewood of the fretted bamboo pattern characteristic of the Chinese. Elaborate bedsteads, tables and cabinets were also made, with panels of ash stained a dark color and ornamented with hunting scenes, in which the men and horses are of ivory, or sometimes with ivory faces and limbs, the clothes being chiefly in a brown colored wood. In a beautiful table in the South Kensington Museum, which is said to have been made in Cochin-China, mother of pearl is largely used and produces a rich effect. The furniture brought back by the Duke of Edinburgh from China and Japan is of the usual character imported, and the remarks hereafter made on Indian or Bombay furniture apply equally to this adaptation of Chinese detail to European designs. 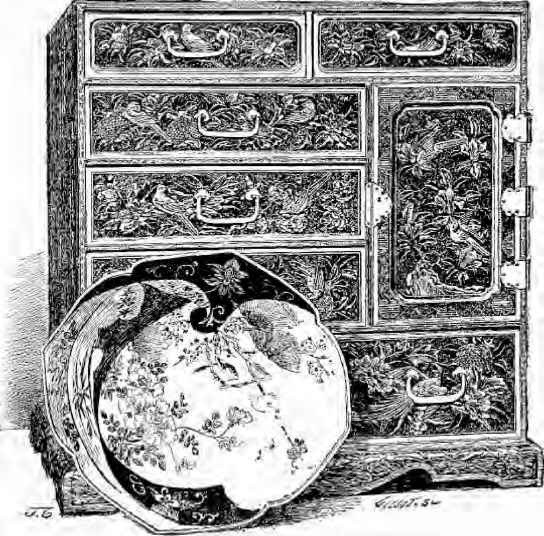 The most highly prized work of China and Japan in the way of decorative furniture is the beautiful lacquer work, and in the notice on French furniture of the eighteenth century, in a subsequent chapter, we shall see that the process was adopted in Holland, France and England with more or less success. It is worth while, however, to allude to it here a little more fully. "The wood when smoothly planed is covered with a sheet of thin paper or silk gauze, over which is spread a thick coating made of powdered red sandstone and buffalo's gall. This is allowed to dry, after which it is polished and rubbed with wax, or else receives a wash of gum water, holding chalk in solution. The varnish is laid on with a flat brush, and the article is placed in a damp drying room, whence it passes into the hands of a workman, who moistens and again polishes it with a piece of very fine grained soft clay slate, or with the stalks of the horse-tail or shave grass. It then receives a second coating of lacquer, and when dry is once more polished. These operations are repeated until the surface becomes perfectly smooth and lustrous. There are never applied less than three coatings and seldom more than eighteen, though some old Chinese and some Japan ware are said to have received upwards of twenty. As regards China, this seems quite exceptional, for there is in the Louvre a piece with the legend 'lou-tinsg,' i.e. six coatings, implying that even so many are unusual enough to be worthy of special mention." There is as much difference between different kinds and qualities of lac as between different classes of marquctcrie. The most highly prized is the LACQUER ON GOLD GROUND, and the specimens of this which first reached Europe during the time of Louis XV., were presentation pieces from the Japanese Princes to some of the Dutch officials. Gold ground lacquer is rarely found in furniture, and only as a rule in some of those charming little boxes, in which the luminous effect of the lac is heightened by the introduction of silver foliage on a minute scale, or of tiny landscape work and figures charmingly treated, partly with dull gold and partly highly burnished. Small placques of this beautiful ware were used for some of the choicest pieces of Gouthiere's elegant furniture made for Marie Antoinette. Aventurine lacquer closely imitates in color the sparkling mineral from which it takes its name, and a less highly finished preparation is used as a lining for the small drawers of cabinets. Another lacquer has a black ground, on which landscapes delicately traced in gold stand out in charming relief. Such pieces were used by Riesener and mounted by Gouthiere in some of the most costly furniture made for Marie Antoinette; some specimens are in the Louvre. It is this kind of lacquer, in varying qualities, that is usually found in cabinets, folding screens, coffers, tables, etageres, and other ornamental articles of furniture. Enriched with inlay of mother of pearl, the effect of which is in some cases heightened and rendered more effective by some transparent coloring on its reverse side, as in the case of a bird's plumage or of those beautiful blossoms which both Chinese and Japanese artists can represent so faithfully. A very remarkable screen in Chinese lacquer of later date is in the South Kensington Museum; it is composed of twelve folds each ten feet high, and measuring when fully extended twenty-one feet. This screen is very beautifully decorated on both sides with incised and raised ornaments painted and gilt on black ground, with a rich border ornamented with representations of sacred symbols and various other objects. The price paid for it was £1,000. There are also in the Museum some very rich chairs of modern Chinese work, in brown wood, probably teak, very elaborately inlaid with mother-of-pearl; they were exhibited in Paris in 1867. Of the very early history of Japanese industrial arts we know but little. We have no record of the kind of furniture which Marco Polo found when he travelled in Japan in the thirteenth century, and until the Jesuit missionaries obtained a footing in the sixteenth century and sent home specimens of native work, there was probably very little of Japanese manufacture which found its way to Europe. The beautiful lacquer work of Japan, which dates from the end of the sixteenth and the following century, leads us to suppose that a long period of probation must have occurred before the Arts, which were probably learned from the Chinese, could have been so thoroughly mastered. Of furniture, with the exception of the cabinets, chests, and boxes, large and small, of this famous lac, there appears to have been little. Until the Japanese developed a taste for copying European customs and manners, the habit seems to have been to sit on mats and to use small tables raised a few inches from the ground. Even the bedrooms contained no bedsteads, but a light mattress served for bed and bedstead. The process of lacquering has already been described, and in the chapter on French furniture of the eighteenth century it will be seen how specimens of this decorative material reached France by way of Holland, and were mounted into the "meubles de luxe" of that time. With this exception, and that of the famous collection of porcelain in the Japan Palace at Dresden, probably but little of the art products of this artistic people had been exported until the country was opened up by the expedition of Lord Elgin and Commodore Perry, in 1858-9, and subsequently by the antiquarian knowledge and research of Sir Rutherford Alcock, who has contributed so much to our knowledge of Japanese industrial art; indeed it is scarcely too much to say, that so far as England is concerned, he was the first to introduce the products of the Empire of Japan. The Revolution, and the break up of the feudal system which had existed in that country for some eight hundred years, ended by placing the Mikado on the throne. There was a sale in Paris, in 1867, of the famous collection of the Shôgun, who had sent his treasures there to raise funds for the civil war in which he was then engaged with the Daimio. This was followed by the exportation of other fine native productions to Paris and London; but the supply of old and really fine specimens has, since about 1874, almost ceased, and, in default, the European markets have become flooded with articles of cheap and inferior workmanship, exported to meet the modern demand. The present Government of Japan, anxious to recover many of the masterpieces which were produced in the best time, under the patronage of the native princes of the old régime, have established a museum at Tokio, where many examples of fine lacquer work, which had been sent to Europe for sale, have been placed after repurchase, to serve as examples for native artists to copy, and to assist in the restoration of the ancient reputation of Japan. There is in the South Kensington Museum a very beautiful Japanese chest of lacquer work made about the beginning of the seventeenth century, the best time for Japanese art; it formerly belonged to Napoleon I. and was purchased at the Hamilton Palace Sale for £722: it is some 3 ft. 3 in. long and 2 ft. 1 in. high, and was intended originally as a receptacle for sacred Buddhist books. There are, most delicately worked on to its surface, views of the interior of one of the Imperial Palaces of Japan, and a hunting scene. Mother-of-pearl, gold, silver, and aventurine, are all used in the enrichment of this beautiful specimen of inlaid work, and the lock plate is a representative example of the best kind of metal work as applied to this purpose. H.R.H. the Duke of Edinburgh has several fine specimens of Chinese and Japanese lacquer work in his collection, about the arrangement of which the writer had the honour of advising his Royal Highness, when it arrived some years ago at Clarence House. The earliest specimen is a reading desk, presented by the Mikado, with a slope for a book much resembling an ordinary bookrest, but charmingly decorated with lacquer in landscape subjects on the flat surfaces, while the smaller parts are diapered with flowers and quatrefoils in relief of lac and gold. This is of the sixteenth century. The collections of the Earl of Elgin and Kincardine, Sir Rutherford Alcock, K.C.B., Mr. Salting, Viscount Gough, and other well-known amateurs, contain some excellent examples of the best periods of Japanese Art work of the seventeenth and eighteenth centuries. The grotesque carving of the wonderful dragons and marvellous monsters introduced into furniture made by the Chinese and Japanese, and especially in the ornamental woodwork of the Old Temples, is thoroughly peculiar to these masters of elaborate design and skilful manipulation: and the low rate of remuneration, compared with our European notions of wages, enables work to be produced that would be impracticable under any other conditions. In comparing the decorative work on Chinese and Japanese furniture, it may be said that more eccentricity is effected by the latter than by the former in their designs and general decorative work. The Japanese joiner is unsurpassed, and much of the lattice work, admirable in design and workmanship, is so quaint and intricate that only by close examination can it be distinguished from finely cut fret work. European influence upon Indian art and manufactures has been of long duration; it was first exercised by the Portuguese and Dutch in the early days of the United East India Company, afterwards by the French, who established a trading company there in 1664, and since then by the English, the first charter of the old East India Company dating as far back as 1600. Thus European taste dominated almost everything of an ornamental character until it became difficult to find a decorative article the design of which did not in some way or other shew the predominance of European influence over native conception. Therefore it becomes important to ascertain what kind of furniture, limited as it was, existed in India during the period of the Mogul Empire, which lasted from 1505 to 1739, when the invasion of the Persians under Kouli Khan destroyed the power of the Moguls; the country formerly subject to them was then divided amongst sundry petty princes. (1876), there are reproduced some old miniatures from the collection of M. Ambroise Didot. These represent—with all the advantages of the most highly finished printing in gold, silver, and colours—portraits of these native sovereigns seated on their State chairs, with the umbrella, as a sign of royalty. The panels and ornaments of the thrones are picked out with patterns of flowers, sometimes detached blossoms, sometimes the whole plant; the colors are generally bright red and green, while the ground of a panel or the back of a chair is in silver, with arabesque tracery, the rest of the chair being entirely gilt. The couches are rectangular, with four turned and carved supports, some eight or ten inches high, and also gilt. With the exception of small tables, which could be carried into the room by slaves, and used for the light refreshments customary to the country, there was no other furniture. The ladies of the harem are represented as being seated on sumptuous carpets, and the walls are highly decorated with gold and silver and color, which seems very well suited to the arched openings, carved and gilt doors, and brilliant costumes of the occupants of these Indian palaces. After the break up of the Mogul power, the influence of Holland, France, and England brought about a mixture of taste and design which, with the concurrent alterations in manners and customs, gradually led to the production of what is now known as the "Bombay furniture." The patient, minute carving of Indian design applied to utterly uncongenial Portuguese or French shapes of chairs and sofas, or to the familiar round or oval table, carved almost beyond recognition, are instances of this style. One sees these occasionally in the house of an Anglo-Indian, who has employed native workmen to make some of this furniture for him, the European chairs and tables being given as models, while the details of the ornament have been left to native taste. 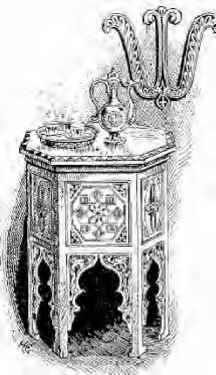 It is scarcely part of our subject to allude to the same kind of influence which has spoiled the quaint bizarre effect of native design and workmanship in silver, in jewellery, in carpets, embroideries, and in pottery, which was so manifest in the contributions sent to South Kensington at the Colonial Exhibition, 1886. There are in the Indian Museum at South Kensington several examples of this Bombay furniture, and also some of Cingalese manufacture. In the Jones Collection at South Kensington Museum, there are two carved ivory chairs and a table, the latter gilded, the former partly gilded, which are a portion of a set taken from Tippo Sahib at the storming of Seringapatam. Warren Hastings brought them to England, and they were given to Queen Charlotte. After her death the set was divided; Lord Londesborough purchased part of it, and this portion is now on loan at the Bethnal Green Museum. Indian in character as regards the treatment of scrolls, flowers, and foliage, shew unmistakcably the influence of French taste in their general form and contour. 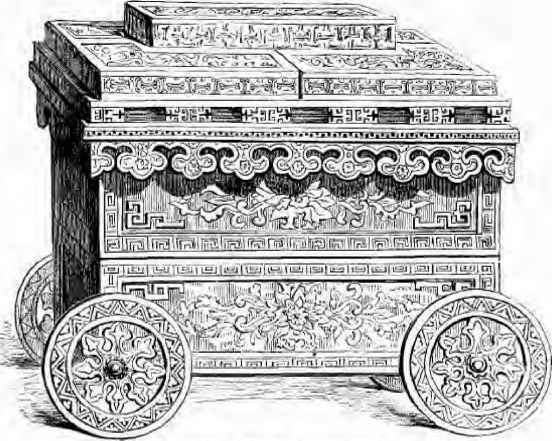 Articles, such as boxes, stands for gongs, etc., are to be found carved in sandal wood, and in dalburgia, or black wood, with rosewood mouldings; and a peculiar characteristic of this Indian decoration, sometimes applied to such small articles of furniture, is the coating of the surface of the wood with red lacquer, the plain parts taking a high polish while the carved enrichment remains dull. The effect of this is precisely that of the article being made of red sealing wax, and frequently the minute pattern of the carved ornament and its general treatment tend to give an idea of an impression made in the wax by an elaborately cut die. The casket illustrated on p. 134 is an example of this treatment. It was exhibited in 1851. The larger examples of Indian carved woodwork are of teak; the finest and most characteristic specimens within the writer's knowledge are the two folding doors which were sent as a present to the Indian Government, and are in the Indian Museum. They are of seventeenth century work, and are said to have enclosed a library at Kerowlee. While the door frames are of teak, with the outer frames carved with bands of foliage in high relief, the doors themselves are divided into panels of fantastic shapes, and yet so arranged that there is just sufficient regularity to please the eye. Some of these panels are carved and enriched with ivory flowers, others have a rosette of carved ivory in the centre, and pieces of talc with green and red colour underneath, a decoration also found in some Arabian work. It is almost impossible to convey by words an adequate description of these doors; they should be carefully examined as examples of genuine native design and workmanship. Mr. Pollen has concluded a somewhat detailed account of them by saying:—"For elegance of shape and proportion, and the propriety of the composition of the frame and sub-divisions of these doors, their mouldings and their panel carvings and ornaments, we can for the present name no other example so instructive. We are much reminded by this decoration of the pierced lattices at the S. Marco in Venice." There is in the Indian Museum another remarkable specimen of native furniture— namely, a chair of the purest beaten gold of octagonal shape, and formed of two bowls reversed, decorated with acanthus and lotus in repousee ornament. This is of eighteenth century workmanship, and was formerly the property of Runjeet Sing. The precious metal is thinly laid on, according to the Eastern method, the wood underneath the gold taking all the weight. There is also a collection of plaster casts of portions of temples and palaces from a very early period until the present time, several having been sent over as a loan to the Indian and Colonial Exhibition of 1886, and afterwards presented by the Commissioners to the Museum. A careful observation of the ornamental details of these casts leads us to the conclusion that the Byzantine style which was dominant throughout the more civilized portion of Asia during the power of the Romans, had survived the great changes of the Middle Ages. As native work became subject more or less to the influence of the Indo-Chinese carvers of deities on the one side, and of the European notions of the Portuguese pioneers of discovery on the other, a fashion of decorative woodwork was arrived at which can scarcely be dignified by the name of a style, and which it is difficult to describe. Dr. Birdwood, in his work on Indian Art, points out that, about a hundred years ago, Indian designs were affected by the immigration of Persian designers and workmen. The result of this influence is to be seen in the examples in the Museum, a short notice of which will conclude these remarks on Indian work. The copy in shishem wood of a carved window at Amritzar, in the Punjaub, with its overhanging cornice, ornamental arches, supported by pillars, and the whole surface covered with small details of ornament, is a good example of the sixteenth and seventeenth century work. The various façades of dwelling-houses in teak wood, carved, and still bearing the remains of paint with which part of the carving was picked out, represent the work of the contemporary carvers of Ahmedabad, famous for its woodwork. Portions of a lacquer work screen, similar in appearance to embossed gilt leather, with the pattern in gold, on a ground of black or red, and the singular Cashmere work, called "mirror mosaic," give us a good idea of the Indian decoration of the eighteenth and early nineteenth centuries. This effective decoration is produced by little pieces of looking-glass being introduced into the small geometrical patterns of the panels; these, when joined together, form a very rich ceiling. The bedstead of King Theebaw, brought from Mandalay, is an example of this mixture of glass and wood, which can be made extremely effective. The wood is carved and gilt to represent the gold setting of numerous precious stones, which are counterfeited by small pieces of looking-glass and variously-coloured pieces of transparent glass. Some of the Prince of Wales' presents, namely, chairs, with carved lions forming arms; tables of shishem wood, inlaid with ebony and ivory, shew the European influence we have alluded to. Amongst the modern ornamental articles in the Museum are many boxes, pen trays, writing cases, and even photograph albums of wood and ivory mosaic work, the inlaid patterns being produced by placing together strips of tin wire, sandal wood, ebony, and of ivory, white, or stained green: these bound into a rod, either triangular or hexagonal, are cut into small sections, and then inlaid into the surface of the article to be decorated. Papier maché and lacquer work are also frequently found in small articles of furniture; and the collection of drawings by native artists attests the high skill in design and execution attained by Indian craftsmen.